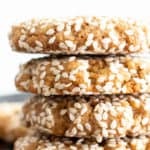 Easy Gluten Free Vegan Oatmeal Raisin Cookies (V, GF, DF): an easy recipe for soft and chewy oatmeal cookies bursting with juicy raisins. Vegan, Gluten Free, Dairy-Free. So, funny thing…I just learned a brand new fact about my sister Jenny. Ya know, the sister I’ve known for, like, my whole life. Okay, scratch the “like” and let’s just go with my whole, entire life. Woah! Does it ever throw you for a loop when you learn something new about someone you’ve known forever? You thought you knew everything there already was to know, but then they decided to keep you on your toes and announce something you really feel like you should have known already? <– Hands raised if just reading that sentence made you dizzy. And you’re searching your brain, thinking, how did I not know this? Could it be because of the hereditary forgetfulness in my family (ahem, I’m looking at you, Mommy)? Or the fact that this person just changed her mind and covertly added this fact to her Facebook all-there-is-to-know-about-me-without-actually-knowing-me profile fact sheet while you weren’t looking? Okay, Jenny doesn’t even have a Facebook because she’s avant garde like that. And she totally would roll her eyes at me calling her “avant garde” then ask me to use it in a sentence. But I totally just did already, so there, Jenny! And ya know, the whole I bake for a semi-living thing. I should know this! Let me tell you, I am blushing all the lovely-but-not shades of red and green right now. I am totally a bad sister, right? Okay, don’t answer that! In any case, I’ve checked with Erik, otherwise known as the Family Historian aka Holder of All the Facts About Everyone Dude and he says that he didn’t know it either! So I’m off the hook, right Jenny? Riiiiight? Either way, Erik and I just sent her a big ol’ box of these Easy Gluten Free Vegan Oatmeal Raisin Cookies and she gave her biggest seal of approval: texting me that they were her Number 1. In front of Best Vegan Brownies, which used to hold that coveted spot. Meanwhile, I was still numb, eyes big as saucers all weekend long, trying to unblow my mind from the little nugget about oatmeal raisins being her favorite. Monica, Penny, Grams, did you know this? I have to text them at once, and see if they’ve finally surged ahead of me in the forever-ongoing family trivia showdown, and more importantly, Erik, in the Family Facts throwdown. I’ll keep you posted. 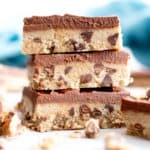 In the mean time, you have to check out this seriously amazing Gluten-Free Vegan Cookie Crunch Cereal from my friend Chrystal at Gluten-Free Palate! 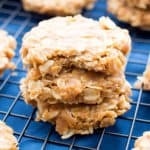 It basically fulfills all of my childhood dreams of cookies for breakfast!! 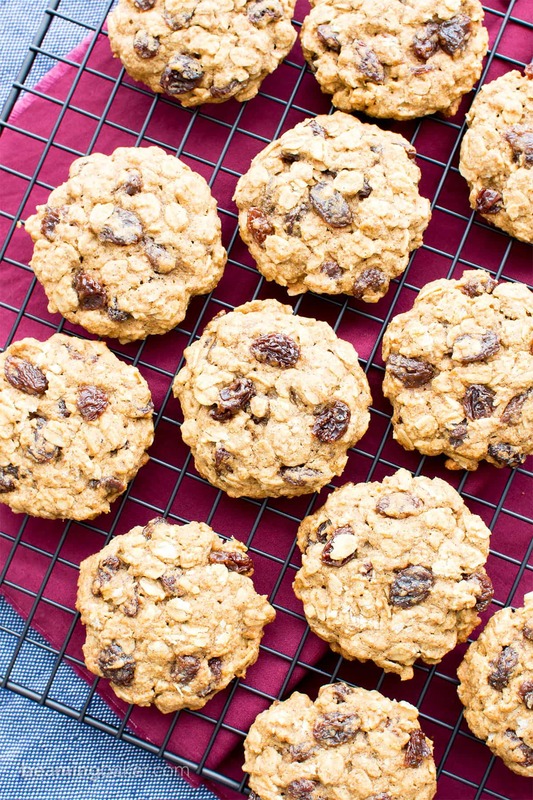 Anyway, while I still recover from this earth-shattering news, would you like to hear all about these easy Gluten Free Vegan Oatmeal Raisin Cookies? Let’s go ahead and dedicate these cookies to Jenny. We’re gonna pretend like that was my intention all along. And hopefully, hopefully, secure my spot as favorite sister. Even though no one has favorites. When have you been surprised to learn a new fact about someone you’ve known forever? 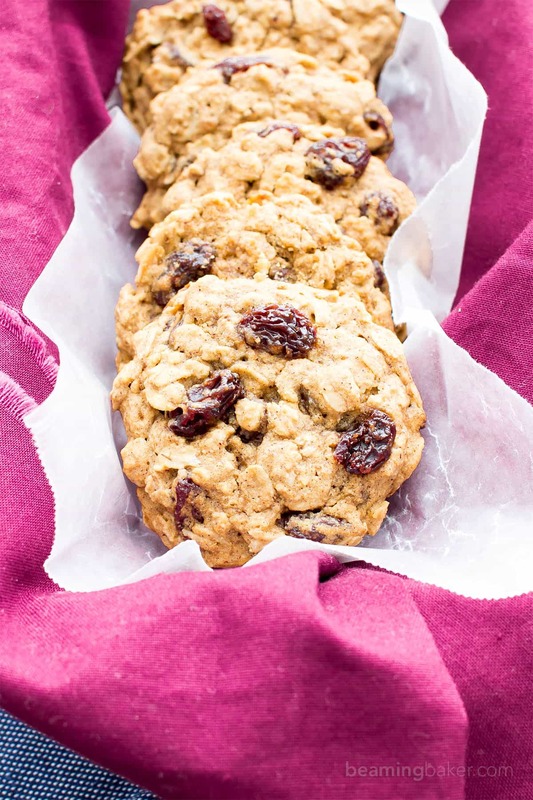 Easy Gluten Free Vegan Oatmeal Raisin Cookies (V, GF, DF): an easy recipe for soft and chewy oatmeal cookies bursting with juicy raisins. Vegan, Gluten-Free, Dairy-Free, Oat Flour, Refined Sugar-Free. 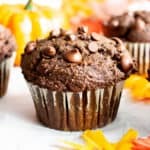 In a medium bowl, whisk together all the dry ingredients: oats, oat flour, baking powder, baking soda, cinnamon and salt. Add the dry ingredients to the wet ingredients. Whisk until thoroughly combined. 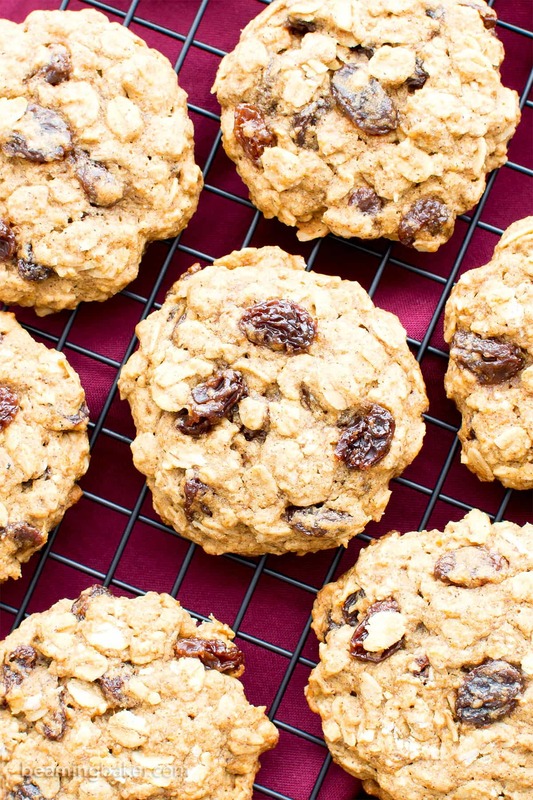 Fold in raisins and oats. The dough will be sticky. Using a medium cookie scoop, scoop cookie dough and drop onto the prepared baking sheet. Using a fork, flatten cookies into a round disc—they will not spread during baking. 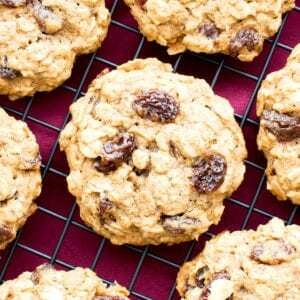 Optionally, press raisins into the tops of the cookies. Bake for 8-12 minutes. Mine took 10 minutes. Using a flat, heatproof spatula, carefully lift cookies off the baking sheet and transfer to a cooling rack. Allow to cool completely. Enjoy! Storing instructions below. - Adapted from my Gluten Free Vegan Oatmeal Chocolate Chip Cookies and my Maple Pecan Chocolate Chip Cookies. - Freezing instructions: store in an airtight, freezer-friendly container in the freezer for 1-2 months. Before enjoying, allow to thaw for 10-20 minutes at room temperature, or heat in the microwave in 10-second increments until warm. 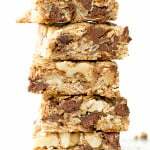 - More cookie recipes (all V, GF, DF): almond butter chocolate chip walnut oat cookies, peanut butter chocolate chip oatmeal cookies, oatmeal raisin cookie bars. 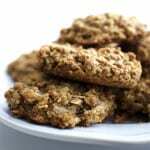 - Nutritional Info: is an estimate based on 25 total cookies. 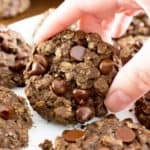 I just tried the recipe and the cookies tasted great. The only issue I had was that they fell apart. What did I do wrong? Can the coconut oil be substituted with dairy free spread and the coconut sugar plus maple syrup with regular sugar? Would like to make this for a child with lots of allergies but not sure if he can have coconut! 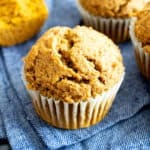 Can I substitute a coconut oil with a rice bran oil and a coconut sugar with a brown sugar? Do I need to adjust the proportion of this two ingredient? I am a breastfeeding mom and my baby need to avoid all dairy products, egg, nut and wheat flour. Hi Jessy, I’m not 100% sure about rice bran oil as I’ve never used it before. After a bit of searching on the internet, it seems that you *may be able* to substitute it 1:1 ratio for the coconut oil. The brown sugar should work just fine! Good luck with everything. 🙂 Let me know how the cookies turn out! ???? These are amazing!!! Perfect for a rainy Sunday afternoon. Yum! I’ve been on a very low/no sugar diet for a while (and my husband is European, i.e. low-sugar by default) so I completely omitted the maple syrup and found it to be sweet enough. I also cut the raisins to 1/3 cup to further cut back the sugar. Other than that being my personal preference, these are delicious. I just used 2 eggs, and since I can’t have coconut, used vegan butter/shortening and regular organic sugar. I needed to bake 15 minutes, but they came out well. This was a nice simple treat for my gluten-free, dairy-free, soy-free, corn-free, nut-free diet (which, just like it sounds, is difficult!). Thank you! So happy to hear that you enjoyed these, Jessica! Glad to hear that the adjustments you needed to make turned out so well. Happy baking! 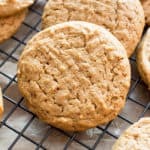 is it possible to use g/f flour instead of oat flour? Hi Sheri! You can use a GF all purpose flour in a 1:1 ratio. Happy baking! Oh no! I’m sorry to hear that, Olivia. 🙁 I’ve never gotten that kind of feedback for this recipe before. Perhaps the oat flour used was packed (or settled at some point), so there was more flour than you thought you were measuring. Try stirring and fluffing it up a bit before scooping. Also, some folks like to spoon and level the flour to avoid this. Good luck! Oh! My! Gosh! 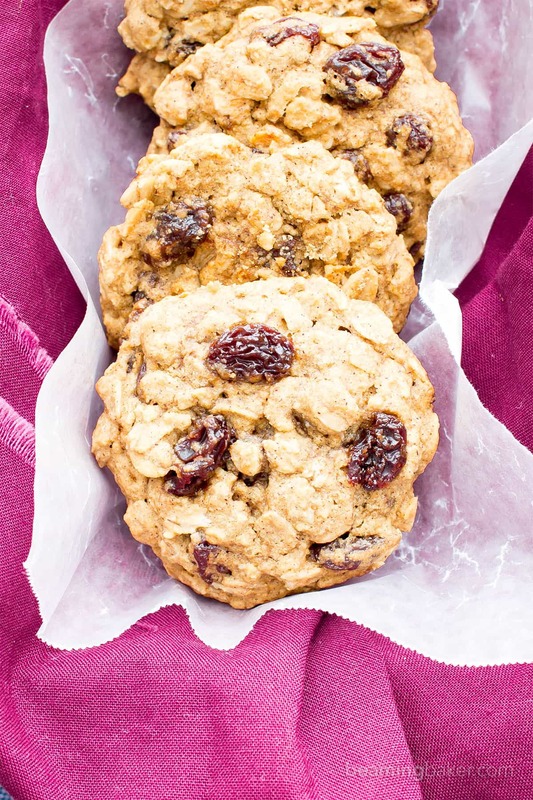 I had my brother-in-law and his family over for lunch today and made these for him as a belated birthday present, since Oatmeal Raisin Cookies are his favorite and his wife is gluten free (not to mention my son has life threatening food allergies). Everyone LOVED them! They asked for the recipe (of course I shared ???? ), and not one crumb was left! I even screwed up in my frenzy to prepare lunch that I accidentally added most of the wet ingredients directly into the dry instead of first mixing them separately. I just whisked it all in my kitchenaid stand mixer for a few minutes to try to salvage it, and that did the trick! Also, sidenote, I used my Nutribullet to make the oat flour – it is seriously awesome for that kind of stuff, because it is super fast (like less than a minute)! Anyway…LOVE, LOVE, LOVE!!! Thank you! Hi Amy!!! First of all: WOOHOOOOOO!!!! I am over the moon that you, your brother and everyone else loved my recipe. And phew!! Thank goodness it all worked out. 😉 Thank you for sharing with your loved ones and for taking time out of your day to leave such a wonderful comment. Happy Baking!! ???????????? 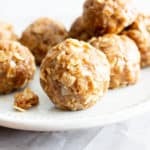 Is there anything you can use instead of oats? Hi Jenn! I’m so happy to hear that you and the kiddos enjoyed the cookies! 😊 Glad that the agave sub worked for you. Thanks for taking the time to share these kind words!